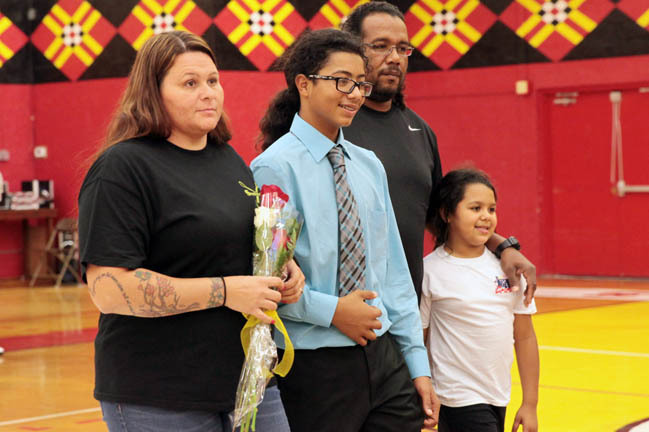 BRIGHTON — Eighth-grade players on Pemayetv Emahakv Charter School’s girls and boys basketball teams showed their appreciation for the support of their parents Jan. 20 during the last home games of the season. The players’ biggest fans were each given a rose at center court. The teams took on Osceola Middle School with the girls winning 33-21 and the boys losing 39-32. Regardless of the outcome, the eighth-graders were glad to play for their school. The girls and boys teams each have three eighth-graders who will leave for high school in the fall. Vivianna Gore, Cady Osceola and Aleina Micco will miss playing for the Lady Seminoles. Aleina Micco, 14, who has yet to decide whether to attend Moore Haven or Okeechobee High School, has played on the team since sixth grade. Cady Osceola, 14, will attend Okeechobee High in the fall. For their high scoring ability and versatility, girls coach Tim Thomas will miss his most experienced players. Boys coach Kevin Jackson knows there will be work to accomplish with next year’s team. Andrew Fish, 14, and Lucas Osceola, 13, plan to attend and play for Okeechobee High next year. Alyke Baker, 13, will attend Lake Placid High in the fall. Beverly Bidney has been a reporter and photographer for The Seminole Tribune since 2012. 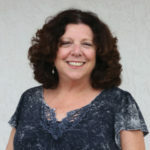 During her career, she has worked at various newspapers around the country including the Muskogee Phoenix in Oklahoma, Miami Herald, Associated Press, USA Today and other publications nationwide. A NAJA award winning journalist, she has covered just about everything over the years and is an advocate for a strong press. Contact her at beverlybidney@semtribe.com.